The Golden Globes are known as the award show where anything can happen. 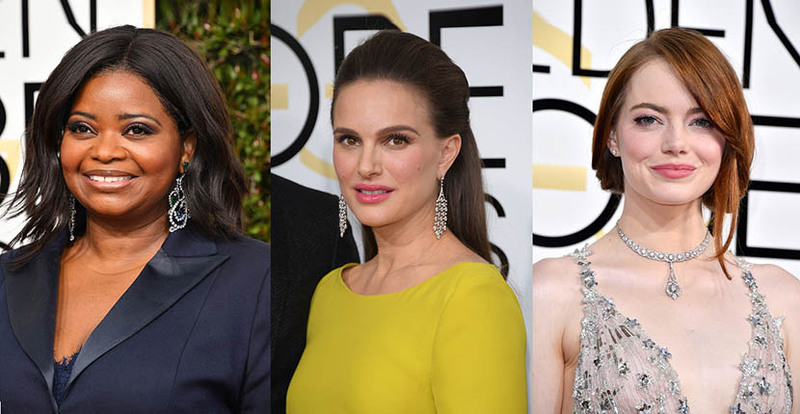 The same could be said of the jewelry that came down the red carpet on the stars at the 2017 Globes. There was everything from big diamond necklaces to a fresh spin on classic pearls and velvet ribbon chokers that cost just a few dollars. The best jewels of the evening ran the gamut of gorgeous styles in a range of prices. NATALIE PORTMAN The Jackie star put on a gorgeous pair of Tiffany diamond fringe earrings with her yellow Prada gown. 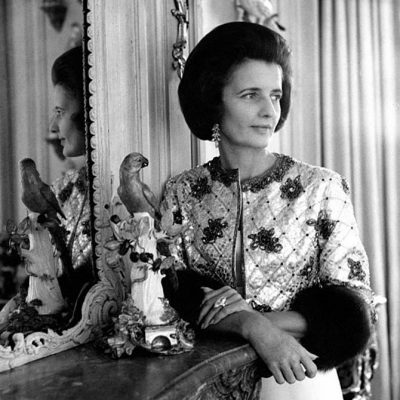 She also had on white and yellow gold diamond rings and a platinum and diamond vintage bracelet from the American jeweler. 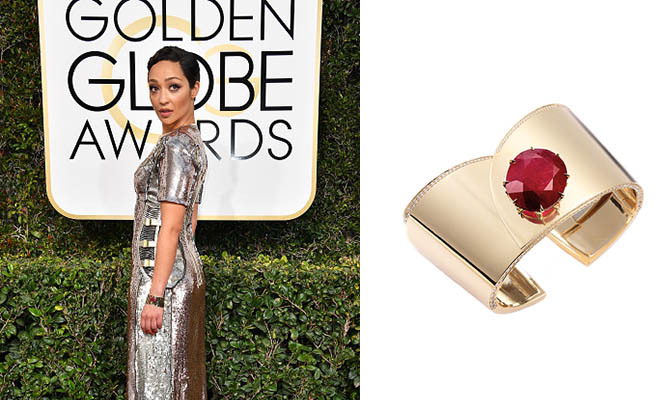 RUTH NEGGA A statement cuff by Fred Leighton set with a 25.51-carat Gemfields ruby was the magnificent jewel, the leading lady of Loving chose to wear with her sequined Louis Vuitton gown. EMMA STONE A vintage diamond and platinum necklace from Tiffany made around 1909 was Emma Stone’s romantic choice for the evening. She paired the piece with a dress covered in stars by Valentino that references one of the sweetest scenes in the film. All of it perfectly reflected the throwback style of La La Land. 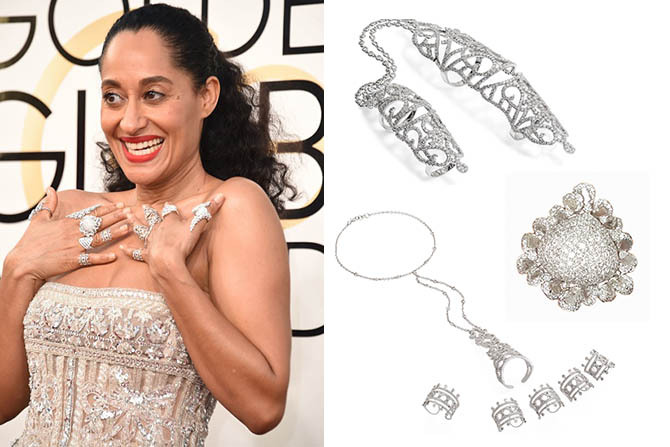 TRACEE ELLIS ROSS The winner of Best Actress in television Comedy or Musical category for her role in Black-ish, went down the red carpet in a dazzling assortment of diamond rings and hand pieces by Noudar, Yeprim, Kavant & Sharart and L’Dezen by Payal Shah. AMY ADAMS The star of Arrival and Nocturnal Animals sparkled on the red carpet in four gorgeous jewels from Cartier. A bracelet from the Cartier High Jewelry collection was the center piece of the collection. It featured a brown tourmaline, obsidian and diamonds. DREW BARRYMORE In February we will see more from Barrymore in the Netflix series Santa Clarita Diet. 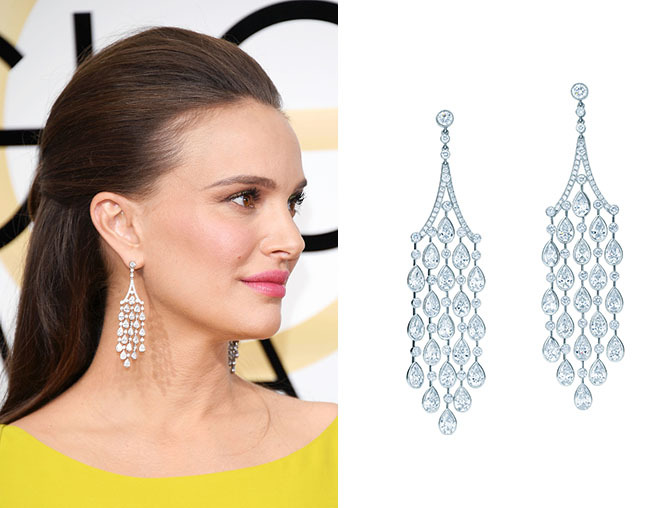 Tonight on the red carpet the leading lady looked stunning in over $2.5 million in Harry Winston diamond jewelry. SIENNA MILLER The boho beauty remade the image of pearls with her stunning red carpet appearance in a pearl necklace, bracelet and rings from Tiffany. 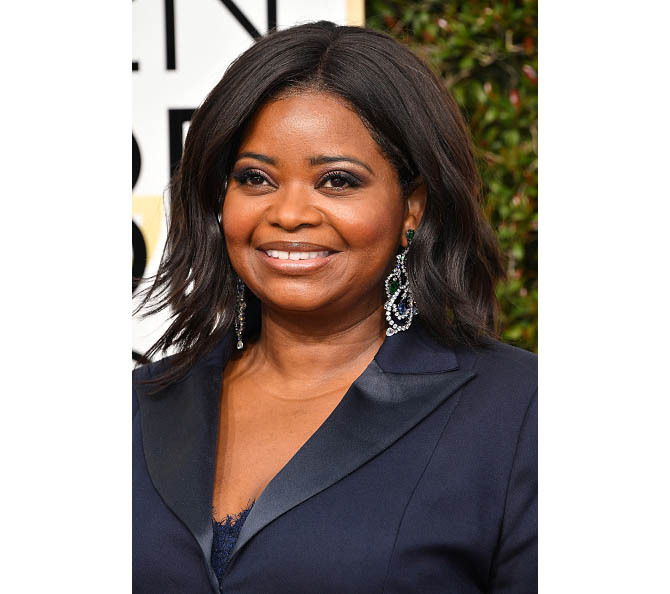 OCTAVIA SPENCER A simple and perfect black tuxedo was Spencer’s choice for attire. Her jewelry was absolutely sensational diamond and emerald pendant earrings and a huge ring from Lorraine Schwartz. 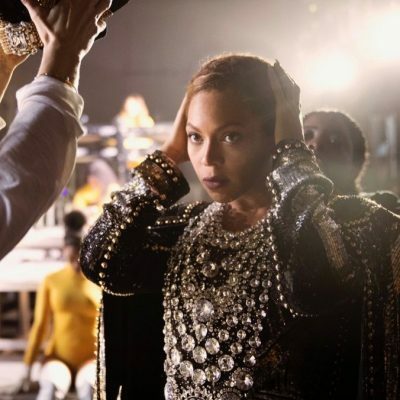 PRIYANKA CHOPRA Jewelry designer Lorraine Schwartz worked overtime to create a custom diamond necklace for the Quantico star featuring a 45-carat diamond pendant. 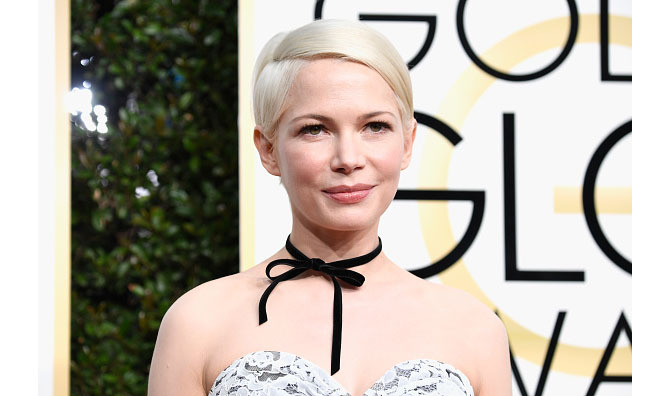 MICHELLE WILLIAMS The chic Manchester by the Sea actress accessorized her Louis Vuitton dress with on-trend velvet choker tied in a simple bow. Her accessory choice could easily be had for just a few of dollars.